who we are, who we are becoming. This happens as we write. Because a few direct questions can offer insight, I'm happy to present Fast Five — short interviews with my favorite writers. Life may be short but who doesn't have time for five questions? 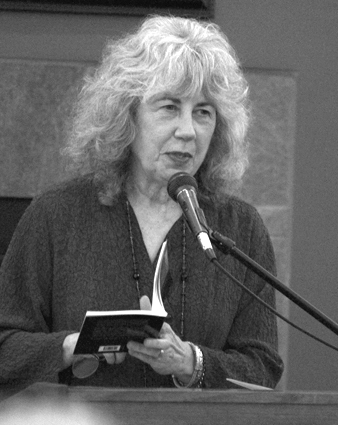 Paulann Petersen, Oregon’s Poet Laureate, is a former high school teacher and author of five poetry collections and four chapbooks. She has led workshops and given readings in hundreds of places — from Powell's in Portland to Omsania University in India — and in nearly every nook and cranny of Oregon. A Portland native, she is a member of Friends of William Stafford and organizes the annual Stafford birthday readings. Petersen’s most recent book is The Voluptuary, published in 2010. You are an accomplished poet and teacher, and now Oregon's esteemed poet laureate. What do you know now that you didn't know when you first started writing poems? I know now what I couldn't have possibly known when I began writing poems: how the process itself would buoy and sustain and inform my life. We write to create ourselves, to discover, to define — moment to moment to moment — who we are, who we are becoming. This happens as we write. Not until I was immersed in the process could I begin to realize its potent effect. You've been called a writer of embodied poetics, and have said, "I believe in body poems, poems that rise from the body." Would you please elaborate? A poem is a creature of sound. A poem comes to us, all poems come to us, through the oral tradition. Yes, a poem has a certain life as mere text on a page. But that life as text is only a fraction of the poem's complete life. A poem can't assume its complete life until it's been given voice. A poem has a sound form, it's comprised of a sequence and combination of sounds. A poem has musical devices. A poem has kinetic energy. A poem has risen from the physicality of its maker, and it speaks to the physicality of a listener. For me, writing a good poem means writing an embodied poem. You've written five full-length poetry books and taught hundreds of classes. What makes a poem work? Sound form. Compression. Line integrity. Unpredictability — a little or a lot. A sense of incipient recklessness. A sense of conveying something that's coded in the blood. These make a poem work. A good poem is a vehicle for transformation. It transforms the listener/reader as she or he hears or reads it. A good poem, in the process of its making, transforms the poet. Of all your poems, which is your favorite? Why? Hmmmmm. I avoid hierarchies when I can. Vertical structures are dicey at best. (Best. There's one of those vertical structure words!) So picking a favorite poem: that's a dicey proposition. But there are two poems that I read frequently when I'm giving readings. And both of them sonically and conceptually feel right to me, even after repeated readings. They are among a group that feel like embodied poems, time after time. "Appetite" and "Bloodline." I'm a collector of words. What are your favorites? I'm smitten with noun lists. I use them when I'm teaching writing workshops (workshops designed to generate new writing from participants). One of the noun lists I give to participants contains nouns I took from my own work. I often remark that I couldn't have a noun list that didn't contain blood, magpie, magnolia, ink, salt, skin and moon. Bonus Question: Is there something distinct about an Oregon poet? or Oregon poetry? Oregon poetry, like Oregon itself, is characterized by remarkable variety. Oregon is mountains, ocean, high desert, rain forest. It's the hotsprings in Hart Mountain Antelope Refuge, the Church of Elvis in downtown Portland, pelicans on Klamath Lake, herons in oaks Bottom on the Willamette. Oregon is abundance; it's variety, vast and gorgeous. Our state teaches its poets inclusiveness and gratitude. Oregon encourages a wide embrace, and its poetry does indeed have a very wide embrace. Another distinction: my bet is that there are, given our total population, as many good poets per capita in Oregon as anywhere on earth.